Lately I’ve been considering making a list of games and developers that respect their players. It hasn’t happened yet, but Puzzlepops! (along with Go to Gold) would be near the very top of the list. It might not be the most gorgeous game, but creator Layton Hawkes took all the right steps to make this puzzle game both mentally challenging and user-friendly. Although it’s been out for about six weeks already, and I added it to my Recommended List almost immediately, the addition of new (free!) puzzle packs that added fifty super-tricky levels is what made me want to write a review. The first hundred levels were certainly well-made and had plenty of devious moments. But the new ones are the work of an evil mastermind, and I loved every second it took to complete them. Here’s how the game works. 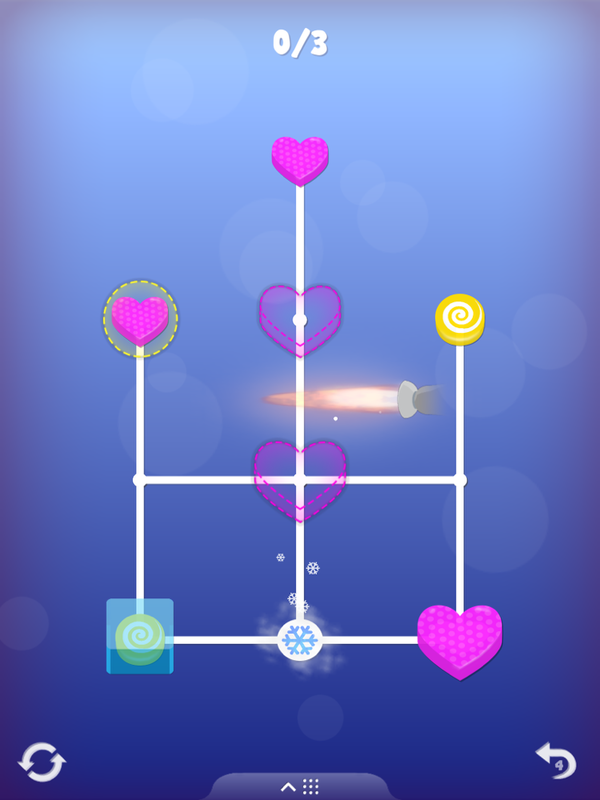 Each level is made up of some tracks and some candies along it. There are also dotted lines, indicating the goal of the puzzle. 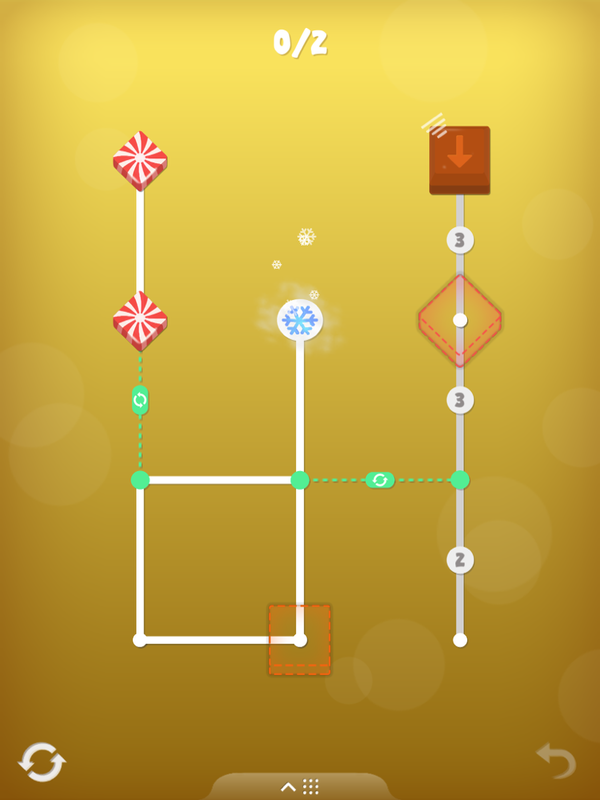 By swiping at a candy, you move it in that direction along the track. If two of the same candy collide, they merge into one bigger candy. If a different candy is in the way, it will block the path of the other. It sounds simple, but it gets quite devious when you introduce other elements. For instance, candy hearts are attracted to each other and will automatically pull in other hearts that they land within sight of. Jawbreakers smash other candy in their path. Then there’s fire that melts candy and freezing spots which coat a candy in ice. A frozen candy can’t mix with another candy, and it also doesn’t get crushed by jawbreakers. On top of all this, the game also adds a shake mechanic. Certain candies like chocolate or special jawbreakers can’t be controlled by swiping. They all move at the same time in the direction their arrow points when you shake your device (or double-tap the screen). 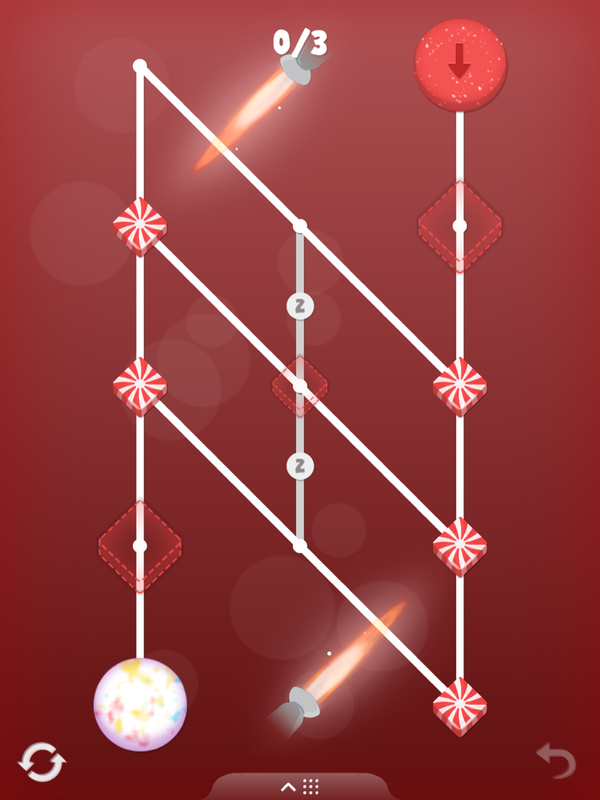 There are also special tracks that require a shake to move the candy from one end to the other. It gets tricky when you’re trying to make several shake-to-move pieces go where you want and they all move at the same time. 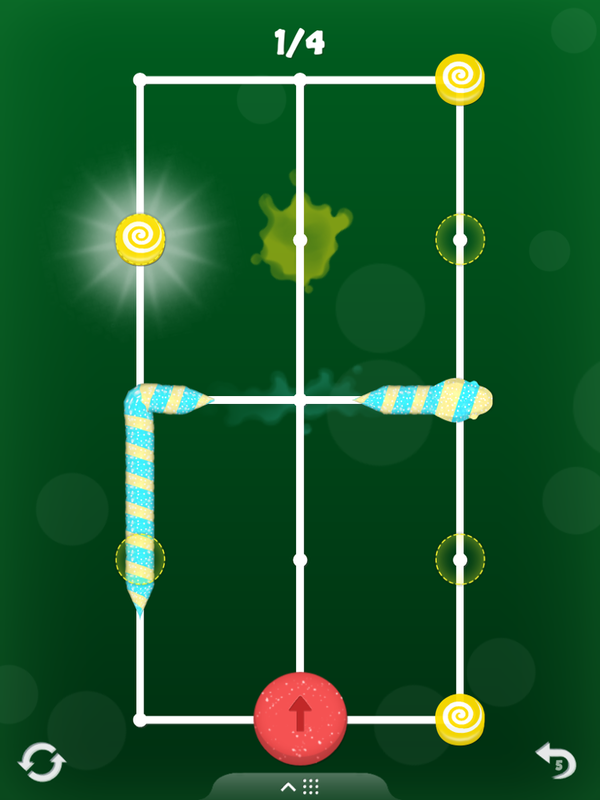 There are no timers or move counts in Puzzlepops!, so it’s perfect for anyone who likes a good stress-free brain workout. If you mess up, the “reload” button is right there on the same screen so as not to waste any of your time. There’s also an “undo” button, but it only saves the previous five moves. Any further back than that and you’ll have to restart. I greatly appreciate the existence of the undo button, but sometimes do wish it went back more than five moves. For instance, when I waste moves just moving a piece back and forth between the same two spots. Or when I accidentally shake my phone (or the shaky train I’m on does it), wasting a turn. Perhaps to solve the accidental shaking issue, there could be an option to shut that feature off and just use the double-tap for those mechanics. Still, it’s a small issue and the “undo” button prevents any real frustration as a result of it. The game also utilizes flawless iCloud syncs so you can play on one device and pick up on another. I prefer to play on my iPhone since it’s a perfect one-handed game. But I appreciate that I can play on my iPad, too, without having to start over. It also means I don’t have to worry about losing my progress if I need to delete the game for some reason. And, of course, I should mention that, unlike a certain popular candy-themed game, this one has no micro-transactions for consumables, or any in-app purchases (IAP) at all. You never have to be reminded of your wallet while playing. And last but not least, you can see the developer respects the players because of the freedom he gave us. If you complete a certain number of levels in a pack, you unlock the entire next pack, which can be played in any order. I’m a strong advocate for unlocking all levels in puzzle games and I’m so glad that the developer took this route. I played the first seventy or eighty levels in order, but after that it was a blessing to be able to jump around and take a break from a puzzle that was giving me trouble. In fact, in the the latest level pack, I solved the first one (136) last! Had I been forced to solve that level before moving on, I might have lost interest altogether. I really have very little to complain about with Puzzlepops! Earlier sections have some filler, but it’s understandable, as you’re eased into the game and taught each of the different mechanics. Had the game been just the first hundred levels, it might have been slightly underwhelming because it takes a while to get to the real meaty puzzles. But there is no filler in the latest content. With the introduction of the gummy snakes and paths that disappear after a certain number of uses, you’ll be working your brain pretty hard. I’m just sad that I finished all the available content and hope we might one day see a level editor with unlimited user-created content. Don’t rob yourself of this fantastic puzzle experience. I can’t recommend Puzzlepops! highly enough. So grab it here and melt your brain! I’m really enjoyIng this game, but I’m annoyed that I can’t unlock beyond 130 unless I complete everything that has come before. I’m completely stuck on 99, 120, and 125! I can try to make videos for those levels.